When I visited the ground over a fortnight ago, there were flowers growing on the pitch and it didn't seem real that a European game could be played there. But having trained with my team when we arrived at Shannon I am more than happy. 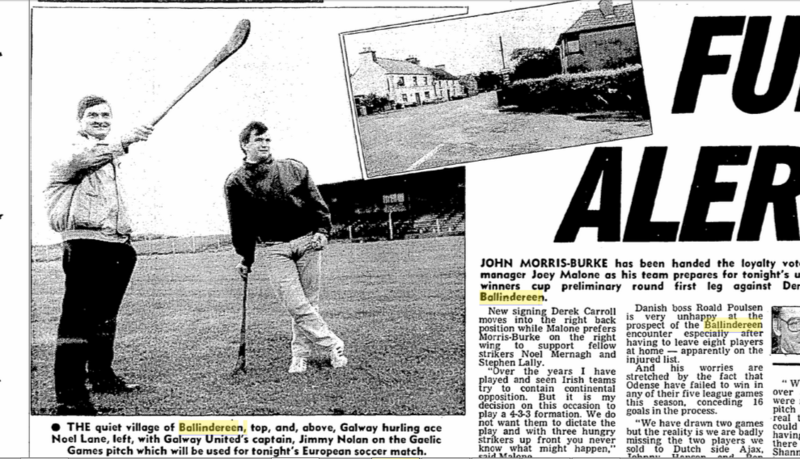 In the summer of 1991, the chairman of Galway United arranged to meet the chairman of Ballinderreen hurling club, Michael Kelly, in Galway City. He was under pressure and time was running out. Their players landed them in a jam by winning the FAI Cup that May, unexpectedly defeating Shamrock Rovers 1-0 in the final in Lansdowne Road. This meant European football the following August. They were drawn to play Danish side Odense. Their opponents had been Danish champions in 1989 and entered the big time when they were drawn to play Real Madrid in the 1989/90 European Cup. They were spanked 10-1. Terryland Park, Galway United's home since the late 1970s, wasn't deemed fit for the task. The chairman Niall O'Reilly frantically asked around the GAA clubs in the county, hoping to find a suitable venue for the game. Galway United were making a habit of staging big matches in improbable locations. Five years previously, they had played a UEFA Cup tie against Dutch side FC Gronigen in An Cheathru Rua in Connemara. On that occasion, the GAA flatly refused to make Pearse Stadium available for the match. The pitch in Connemara was a communal one, albeit one that had primarily been used by the GAA. Technically, there was nothing the GAA hierarchy in Galway could do, but they were a little sore about it. Surrounded by stone walls and in very close proximity to the Atlantic, the Connemara pitch somehow passed the requirements set down by UEFA. The Gronigen players were thoroughly discommoded by their surroundings, with Hank Heganauw reminiscing with Paul Keane in the latter's book 'God vs Mortals'. We…went to the pitch in Galway and what the hell! I think, ‘Where are we going to? Maybe we’re on the moon! But that pitch wasn't available to them on this occasion. Ballinderreen was almost their last chance. He met me one day in Galway. They were looking for a pitch. They couldn't get a pitch. No one would give them a pitch in Galway. He was telling me all the places he tried... They tried every place around and they wouldn't give it to them. Ballinderreen is a small village roughly 20km south of Galway City, nestled between Kilcolgan and Kinvara. Almost exclusively concerned with hurling, their most famous player was three-time All-Ireland winner Noel Lane. Ex-Galway hurler and future President of the GAA, Joe McDonagh was also a member of the club. Currently intermediate, they were a senior club at that point. The closest they came to senior success was in 1978 when they were pipped by Ardrahan in a contentious county final replay. It was the tail end of Galway hurling's golden era. Lane, who banged in match-winning goals in both the 1987 and 1988 All-Ireland finals, had just retired from the inter-county scene following the surprising defeat to Cork in the 1990 decider. A couple of weeks before the Odense clash, Galway were soundly beaten by Tipp in the All-Ireland semi-final, prompting the resignation of Cyril Farrell and the departure of a raft of players from the golden era. Michael Kelly told the anxious chairman that he'd call a meeting of the 12-man executive in Ballinderreen. Crucially, their ground wasn't vested in the GAA, meaning the association had no veto over what the club chose to do with the ground. We put it to the meeting anyway. I told them what they were offering us as well. Our stand would hold 600, and they would give us the takings of the stand. And we had the (takings from) shops and all that. The vote wasn't unanimous, but it wasn't close either. The committee voted by 10 votes to 2 to allow the match to proceed in Ballinderreen. The objectors' complaints had a familiar feel. There was only two objectors. There was only two that didn't vote in favour of it. The majority won and we went ahead and told them we'd give them the ground. That time, they didn't want soccer played in a hurling ground. That was the main reason. And they thought it was sacrilege to play soccer (laugh) in a GAA ground. It wasn't heard of that time. One time, you'd get banned for doing something like that. Noel Lane remembers the odd quibble but the main memory is of the excitement around the place. Perhaps briefed on Gronigen's woes in Connemara in '86, the fastidious Odense management landed in deepest Ballinderreen a fortnight in advance of the game. Their manager Ronald Poulsen surveyed the flower speckled playing surface and openly doubted whether such a pitch would be fit for European football in just a couple of weeks. Two weeks later, however, he adopted a different view. The pitch already enjoyed intense local fame for its astonishing drainage capacities. About a decade ago, a washed out Pearse Stadium was adjudged incapable of holding a Railway Cup game. When no other ground in Galway was deemed acceptable, the teams made the 20km jaunt south to Ballinderreen. Local, Paddy Aherne, was out on the pitch when the Munster team jogged out of the dressing room. We went down for a puck around and we saw Colm Cooper coming out of the dressing room. Now, it was when the Railway Cup was dyin' and so there was about thirty people there, but, still, it was class. Kelly recalls the struggle of getting everything ready. They were willing to get the pitch ready. It had to be in good condition for a big game like that, Galway United and Odense. We got eight telephone lines into the ground from Kilcolgan from three and a half miles over the road from us. We had to devote one dressing room for telexes. You know, it was all telex that time, in '91. So, all the international press were there. So, one of our dressing rooms, we had big dressing rooms, that was given to the press. For the match itself, Joey Malone's team were badly weakened by the departures, in the summer, of Johnny Glynn, the goalscorer in the Cup Final, and star midfielder Tommy Keane. Glynn headed for Cork City, where he would win a League title two years later, and Keane, who also represented Ireland at youth level, went to Sligo Rovers. 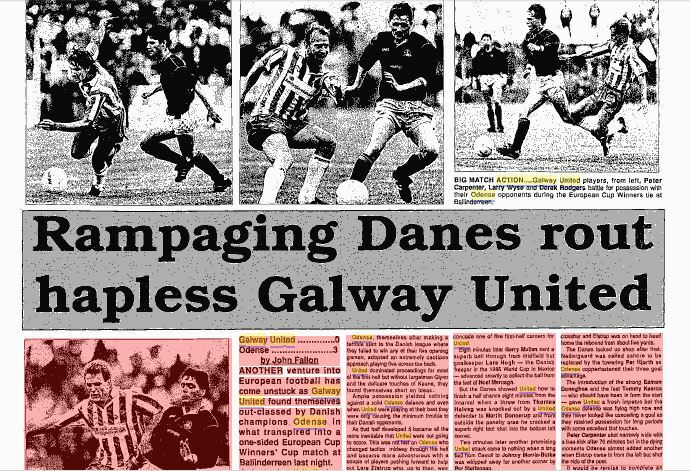 Not only would Galway United suffer in the tie itself, they were relegated from the top flight at the end of the 1991-92 season. They were promoted at the first attempt, and rose to third spot in the League in the 1993-94 season, their highest League finish since 1986. The team played poorly on the night. According to Charlie Stuart's scathing report in the Irish Press, they mustered one rather tame shot on goal through midfielder Gerry Mullan. Galway's team included League of Ireland veterans like John Cleary, Larry Wyse and goalkeeper Declan McIntyre, and Malone boldly announced they were going to attack their opponents by picking three front men, with shaggy-haired winger John Morris-Burke up front alongside Noel Mernagh and Stephen Lally. The ground was bathed in sunshine at the start of the game but a torrential downpour occurred at the start of the second half. The crowd perched on the grass banks on three sides of the ground were unprepared and had to lift their jumpers over their heads to shield themselves from the rain. Lane recalls the (somewhat appropriate) sopping wet conditions by the final whistle. Odense won handily though goals from Micahel Donnerup, Steen Nedergaard and Lars Elstrup. The match was a lucrative affair for the club and they used the money wisely over the coming years. And their versatile ground became a modest tourist attraction for GAA supporters traversing the south Galway region. We done well on it anyway. We had 600 in the stand and it was £10 a head that time for the stand. So, we got £6000 out of the stand and that was a good lot of money at that time. All that went into developing a second pitch. You know, we put it to good use. It got an awful lot of publicity at the time. After that, everyone who was passing Kilcolgan, people from Cork and Limerick, they were all comin' in to see where was pitch and talking about the club that gave it to them. Kelly was much in demand on RTE radio programmes when the GAA finally decided to open up Croke Park to soccer and rugby in the mid-noughties. When they were opening Croke Park, I was on the radio with Des Cahill, I think it was, and I said a lot about when your neighbour would be stuck, you'd help him out.